Russian stocks rose the most in two weeks today as investors bought into an equity market that now has the cheapest valuations in two years. In particular OAO Rosneft, Russia's biggest oil producer, surged as crude oil prices rose for a fourth day. Bank Vozrozhdenie and AFI Development Plc gained after reporting earnings. Crude for October delivery rose as much as $1.74, or 1.5 percent, to $119.89 a barrel in New York as meteorologists forecast Tropical Storm Gustav will be the most damaging since Hurricane Katrina. The ruble-denominated Micex Index climbed 2.6 percent to 1,337.02 at 4:05 p.m. in Moscow, its biggest gain since Aug. 11. The dollar-denominated RTS Index rose 2.4 percent to 1,626.65, a second day of gains. The RTS has retreated more than any other major stock market so far this quarter as Russia sent troops into Georgia, falling oil prices weighed on energy stocks and the government probed steel and coal producer OAO Mechel. The events of July and August pushed the price-to-earnings ratio for the 50-stock RTS to 8.7, the lowest in two years. The ruble is set for its biggest monthly decline against the dollar-euro basket since its introduction in 2005 as rising tensions with the U.S. and European Union prompt investors to reduce holdings of Russian assets. The currency looks likely to lose around 0.7 percent versus the basket this week. Despite the rise of the last 24 hours Russia's dollar-denominated RTS Index is stilll very near its lowest level in almost two years and the benchmark 30-year government bond slipped for a third day today. The currency - whose value is controlled by Bank Rossii via what is known as a "managed float" - was at 24.5675 per dollar by 1:26 p.m. in Moscow, from 24.6125 yesterday, when it gained 0.2 percent. The ruble was at 36.3379 per euro, from 36.2475. Those movements left the currency steady at 29.8540 against the basket, from 29.8483 yesterday. It seems set to lose around 1.8 percent against the basket in August, the biggest monthly fall since the basket was introduced in February 2005. The weighting in the basket is 55% USD and 45% euro. As much as $25 billion in capital has flowed out of Russia since the start of the Georgia crisis, according to BNP Paribas today. However Russia's international reserves, the world's third biggest, rose by $400 million last week according to the latest data from the central bank. Finance Minister Alexei Kudrin told the press on Aug. 17 that investors pulled $7 billion out of the country between Aug. 8-11 alone. However the value of the reserves of the world's largest energy supplier increased to $581.5 billion in the week ended Aug. 22. The reserves had fallen $16.4 billion in the previous week as the central bank bought rubles to support the currency. Thus there is little likelihood in the short term of the present crisis producing a run on reserves of sufficient magnitude to have any noticeable impact on Russian government policy. The economic issues are likely to arise elsewhere. UniCredit SpA analyst Vladimir Osakovsky estimates that the central bank spent about $6 billion to support the ruble as a similar amount left the country in the week to Aug. 22, damping the impact of inflows from oil revenue on the reserves. Bank Rossii has yet to release official figures on net capital flows for the period. The central bank last month started reporting the amount of reserves based on the market value of securities it keeps, rather than on the historical value as was done previously. It has restated the size of the reserves since the beginning of 2008 to bring Russian reporting in line with international standards. The reserves were previously referred to as foreign currency and gold reserves. Russia's reserves have climbed steadily from their $12.3 billion low in 1998. China has the world's largest currency reserves, which were ruuning at around $1.7 trillion at the end of March, followed by Japan with $970 billion at the end of May. Russia's Micex Index fell for a fourth day on Wednesday, on concern that the government's decision to recognize Georgia's breakaway regions will deepen a rift with the West and shake investor confidence. OAO Sberbank, Russia's biggest bank, reached its lowest level in almost two years amid speculation losses in the value of its government ruble-denominated bonds will erode its capital. The ruble-denominated Micex Index lost 1.1 percent to 1,278.72 at 2:22 p.m. in Moscow, after earlier climbing as much as 2.4 percent on a rally in oil prices. The dollar-denominated RTS Index dropped 0.7 percent to 1,567.53, extending its third- quarter decline to 32 percent. UBS AG today cut its price estimates for 74 Russian stocks, citing Medvedev's decision to recognise the two Georgian regions which are in rebellion. Moves in the RTS Index are growing more disconnected from oil as the equity benchmark suffers its worst monthly decline in eight years. Before August, the RTS posted an 11-fold gain this decade while crude climbed almost fivefold. The RTS has lost 15 percent since Russia invaded Georgia on Aug. 8, leaving it 37 percent below its record high of 2,487.92 in May. Sberbank fell for a third day, sinking 1.91 rubles, or 3.4 percent, to 54.10 rubles, the lowest level since September 2006. The bank holds an estimated $10 billion in ruble-denominated Russian government bonds. The yield on Russia's benchmark 30- year 6.9 percent ruble bond has jumped 106 basis points to 8.81 percent since Aug. 7. OAO Gazprom led a jump in the cost of protecting Russian companies from default to the highest in almost five months on investor concern the military incursion in Georgia will trigger a rise in borrowing costs. Credit-default swaps on Gazprom increased 36 basis points to 260 this month, and Moscow-based oil-pipeline operator OAO Transneft rose 33.5 to 265, according to at CMA Datavision prices at 3:15 p.m. in London this afternoon. Contracts on Russia's government debt climbed 32 to 134, the highest since April 2. The credit crisis has already prompted a jump in Russian corporate funding costs, with Russia's largest lender, OAO Sberbank, increasing rates on outstanding loans by an average of 2 percentage points last month. Access to capital for Russian corporations, which had already been severely damaged by the global credit crunch, seems to have further deteriorated on the back of increased political risks. The ruble has now slumped almost 4 percent against the dollar since the five-day war started on Aug. 7, extending its declines further yesterday after Russia recognized the independence of two breakaway regions of neighboring Georgia. Before the conflict, banks such as Merrill Lynch & Co. had predicted above-target inflation would force Russia to let the its currency strengthen by as much as 5 percent to the basket in the next 12 months. The ruble fell to an almost seven-month low against the U.S. currency yesterday after President Dmitry Medvedev signed decrees recognizing the independence of South Ossetia and Abkhazia. The ruble, which had gained more than 1 percent against the basket through by Aug. 7, is now at 29.8504, 0.7 percent weaker than its average basket price over the past 12 months. It rose 0.2 percent to 24.6102 per dollar by 5:45 p.m. in Moscow, and lost 0.3 percent to 36.2560 per euro, after sliding 0.2 percent yesterday. At some point, of course, the central bank will step in and try to firm up support for the ruble, and of course there are no shortage of foreign exchange reserves in Russia at this point. By buying and selling rubles regularly, Bank Rossii contains the currency within a trading band against the basket, which is made up of about 55 percent dollars and 45 percent euros. It manages the ruble in order to limit the impact of its fluctuations on the competitiveness of Russian exporters. The drop in the oil price, if it continues (and this conflict more or less settles the issue for me, since global economic output is bound to be hit negatively, even if at this stage we don't know by how much), is certain to erode Russia's $37 billion current- account surplus in the process cutting support for the currency and breaking the long-term trend of ruble appreciation. Turkey protested to Russia over trade restrictions after trucks were held up at customs posts, hurting exports to Turkey's biggest trading partner. Russian customs inspections, which previously took a few hours, are delaying the entry of Turkish trucks for as long as 20 days, according to an official at Turkey's Trade Ministry. The ministry estimates Turkey could lose as much as $3 billion in exports if the curbs continue, and has sought an explanation from the Russian government. Russia last year was the largest market outside the European Union for Turkish goods, with $4.9 billion of exports, according to the Turkish Assembly of Exporters. Turkey sells textiles and food to Russia, and relies on imports of Russian natural gas for heating and electricity. The restrictions are especially damaging for Turkish textile exporters who are currently selling their winter collections, Trade Minister Kursad Tuzmen said yesterday. Textile and clothing exports were Turkey's biggest foreign currency earner last year, bringing in $22.6 billion to help cap a trade deficit that's widening as energy costs rise. Enka Insaat & Sanayi AS, Turkey's biggest builder, and brewer Anadolu Efes Biracilik & Malt Sanayii fell the most in more than a year in Istanbul trading today on concern that they may lose business in Russia as a result of tensions in the Caucasus. Enka shares declined 80 kurus, or 7 percent, to 10.60 liras at the close of trading in Istanbul today, bringing the company's market value down to 12.7 billion liras ($10.7 billion). Anadolu Efes shares plunged 1.40 liras, or 11 percent, to 11.50 liras, the biggest drop since June 2006. Investors are concerned that Enka, which has won contracts to build airports and power stations in Russia and modernize Russia's parliament buildings, may lose out as the military conflict in Georgia hurts Russia's relations with the North Atlantic Treaty Organization or NATO, in which Turkey is a member. Anadolu Efes beer sales in Russia have surged as the company acquired local brewers. Almost half of Enka's backlog of orders are in Russia, and more than half its assets are in Russia and other CIS countries, Hackett said. Enka owns the Ramstore chain of supermarkets in Russia. From an economic point of view this whole situation is now very serious, and needs careful following by the day. The first signs of contagion seem to be emerging in Turkey. The German economy, which is now slowing rapidly, is evidently the OECD economy which is most at risk by what is happening. The whole of the EU 10 is also very vulnerable to contagion (which seems to have started already in Turkey), plus Ukraine, of course, with Sebastopol an evident focus of attention now, as Bernard Kouchner is pointing out. But Romania could easily get sucked in to any conflict which developed in Moldova, and the following declaration from Valeri Kuzmin Russia's ambassador to Moldova is not exactly likely to calm things down. Russia's ambassador to Moldova, meanwhile, said the country's leaders should be wary of what happened in Georgia and avoid a "bloody and catastrophic trend of events" in the separatist, pro-Russia region of Trans-Dniester. The ambassador, Valeri Kuzmin, said Russia recognized the independence of South Ossetia and Abkhazia because of "Georgia's aggression against South Ossetia." Trans-Dniester broke away from the former Soviet republic of Moldova in 1990. A war broke out between Moldovan forces and separatists in 1992 leaving 1,500 dead. Trans-Dniester is supported by Russia but is not recognized internationally. Russia has 1,500 troops stationed there to guard weapons facilities. Russian President Dmitry Medvedev said on Tuesday he had signed a decree recognizing the Georgian rebel regions of South Ossetia and Abkhazia as independent states. In the aftermath to the diplomatic chaos this decision is causing Russia's RTS Stock Index fell more than 6 percent to hit its lowest level since 2006 and the ruble dropped significantly. The RTS index of 48 companies posted the biggest decline among 89 global equity measures tracked by Bloomberg today, while Russia's currency slid to its lowest level in almost seven months against the dollar. Credit-default swaps on Russian debt climbed 7 basis points, according to CMA Datavision prices in London, as the U.K. Foreign Office ``categorically'' rejected President Dmitry Medvedev's move and Italy and France expressed regret. Medvedev's statement today accelerated a decline sparked by a drop of more than 2 percent in crude and slumping metals prices. The dollar-denominated RTS Index fell 4.3 percent to 1,576.36 at 5:48 p.m. in Moscow, extending its third-quarter drop to 32 percent. The ruble-denominated Micex Index slumped 2.1 percent to 1,292.92, the lowest level since September 2006. VTB Group, Russian's second-biggest bank, plunged 3.2 percent to 6.63 kopeks, the lowest level since its initial public offering last year. OAO Gazprom, the country's biggest publicly traded company, sank for a third day today, losing 0.9 percent to 230.79 rubles. Today's Gazprom fall follows a 2.9 percent fall last Friday after analysts said they were ``shocked'' by the company's plans to raise its investment budget to more than $40 billion this year. Russia's natural-gas exporter has indicated it may raise its investment budget for 2008 by about 25 percent. Gazprom last month already increased the budget for 2008 by 16 percent to a record 822 billion rubles ($33.8 billion). JPMorgan Chase & Co.'s Moscow-based analysts said in a note on Friday that they ``doubted'' the ability of what is Russia's biggest company to invest that amount of money efficiently. The spending signals "potential value destruction" for the stock, the bank said in the note. Credit-default swaps on Russian government debt rose 7 basis points from Aug. 22 to 135, according to CMA Datavision prices at 12 p.m. in London. Contracts on Gazprom rose 11 basis points to 267, CMA prices show. Credit-default swaps, contracts conceived to protect bondholders against default, pay the buyer face value in exchange for the underlying securities or the cash equivalent should a company fail to adhere to its debt agreements. A rise indicates a deterioration in the perception of credit quality; a decline signals the opposite. Rising tension with the West could damage foreign investor sentiment towards Russia, according a statement from the credit ratings agency Fitch after the announcement, although they stressed that they do not immediately see Russia's sovereign rating coming under threat. Fitch head of emerging European sovereigns Edward Parker did however go out of his way to underline how conditions for Russian corporate and quasi-sovereign borrowers may become more difficult in the aftermath the decision to recognise Georgia's rebel regions. He said the fallout of the conflict may also affect sentiment towards other Central European and ex-Soviet states but that the oil and gas-rich country's vast foreign reserves eased the risks to the Russian economy itself in the short term. Fitch rates Russia as "BBB+" with a stable outlook. on capital flows into the country... affecting foreign investment." Parker said Russian foreign exchange reserves saw a slight fall last week but that it was too soon to say if the trend would continue. 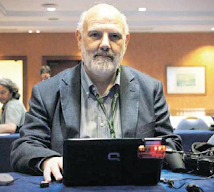 "It's still very early days to assess the impact," he said. "Given that Russia has $580 billion in foreign exchange reserves, it has the ability to ride out weekly changes." But he said some Russian corporate borrowers as well as quasi-sovereigns - firms seen almost indissolubly tied to the state - might face problems with foreign lenders. "There are a significant number of corporates who are very dependent on international capital markets," he said. "There could be an impact on the Russian banking system as well." Investor sentiment towards other regional economies was also being affected, he said. Ukraine is seen amongst the most exposed, with any fall in foreign direct investment potentially making it harder to cover their current account deficit. Parker said there was already some impact on investor sentiment towards the Baltic states as well as Central European countries such as Poland, which has angered Russia by agreeing to house a U.S. missile defence shield. "We don't see any immediate impact -- it's more a potential impact if Russia decides to take more aggressive action in due course," Parker said. "But it is affecting investor sentiment." He said Fitch was keeping a close eye on other "frozen conflicts" in the region such as Moldova's Transdniestria region - which like Abkhazia and South Ossetia is home to Russian peacekeepers - as well as in Azerbaijan and Armenia. "That the Russian government leadership now has chosen this route means they have chosen a policy of confrontation, not only with the rest of Europe, but also with the international community in general." "The decision represents a Russian choice of path that will have sweeping consequences for a long time to come." "The decision represents a breach of international law and basic principles of stability in Europe, which is as obvious as it is intentional." "The Balkanization of the Caucasus on an ethnic basis is a serious danger for everyone." "We reject this categorically and reaffirm Georgia's sovereignty and territorial integrity." "This is contrary to obligations that Russia has repeatedly taken on in (United Nations) Security Council resolutions." "We consider this a regrettable decision and I recall our attachment to the territorial integrity of Georgia." "There will scarcely be a neighbor of Russia's that won't judge this negatively." "Russia will face accusations of breaching international law by Europe and much of the rest of the world. Hardly any other state will follow this (recognition). Russia will stand relatively alone with this step, in contrast to the recognition of Kosovo." "(Europe) is standing relatively helplessly ... as regards an effective response to this Russian statement." "Russia knows that there are very different views among Europeans about sanctions, and that they have limited capacity to impose sanctions. Economic sanctions boomerang back on those who impose them, and diplomatically ... you can't break off all diplomatic contact if you still hope to exert some influence on Russia." "We could expect it because (the regions were) de facto independent, and especially in the last two, three years, Russia has invested large money into both republics. Especially after the conflict in South Ossetia, it was just a question of time before they would recognize them officially." "The Russians are saying there is a Kosovo precedent, but this situation is completely different in each of the republics." "I don't think (there could be a return to fighting) because basically they achieved all their goals, except maybe the removal of (Georgian President Mikheil) Saakashvili. On the other hand, his position is now quite weak." "It's likely capital outflow will continue and probably even intensify on the back of a possible escalation of the conflict and possible economic sanctions against Russia." "Capital outflow is likely to add to the weakening of the rouble which we have been witnessing recently." "The whirlwind crescendo of bad news seems never-ending. But the lower this market goes, the more attractive it becomes for fundamental-based investors who have a longer-term horizon." "We're in a very, very thin market right now. The second half of August is the peak of the vacation season ... it's almost dysfunctional right now." "This is one of the worst corrections we've seen in a decade ... it's bigger than the one in 2004, bigger than the one in 2006." "Across the board the valuations speak for themselves but -- and it's a big 'but' -- no-one wants to be the first to stick their foot back into the market." "It's self-fulfilling: the fewer people buy, the worse the prices get. What you need is an indisputable catalyst for the domestic market. At this point, the only thing we can think of is some kind of announcement on the oil tax regime. That would be indisputably linked to the major part of the market, have an immediate bottom-line impact and draw some people in." "If you look at the RTSI futures, they dropped about 25 points on the news Russia had recognized Abkhazia and South Ossetia. I think what investors have been hoping in the last couple of weeks is for the government to take active steps to minimize the conflict. And the recognition of these two entities is clearly a step in the wrong direction from the stock markets' point of view." "This is a symptom of the poor sentiment toward Russia on the international public level, on the domestic political level, and oil prices are at a new low in recent days and weeks. 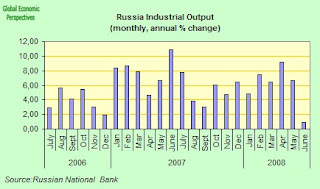 It is very hard to see any positives for the Russian market at the current time." "However, every single stock on MICEX at this point is in the red, and well in the red. You are seeing a host of technical indicators that are telling you this market is grossly oversold. It is hard for me to see how the news gets worse unless oil dips below $105." Investors have been pulling their money out of Russia in the wake of the Georgia conflict at the fastest rate since the 1998 rouble crisis, according to new figures published yesterday. Data released by Russia’s central bank showed a drop in foreign currency reserves of just over $16.4bn in the week beginning August 8. This was one of the largest absolute weekly drops in 10 years. The only larger drop in reserves since 1998 was $16.5bn in June 2006, when Russia paid off the bulk of its Paris club debt. Russian debt and equity markets have also suffered sharp falls since the conflict began on August 8, with yields on domestic rouble bonds increasing by up to 150 basis points in the last month. 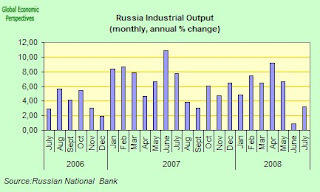 Russian industrial output growth continued to show signs of weakness in July after expanding at the slowest pace in five and a half years in June. Industrial output increased at a 3.2 percent annual rate compared with 0.9 percent increase in June, according to data from the Federal Statistics Service earlier today. 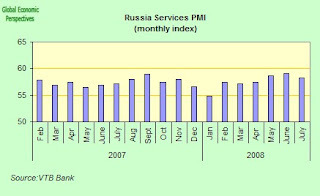 The June result was the slowest rate of growth since the service began calculating data under new methodology in 2003. Month on month output was up 3.3 percent from June. Manufacturing increased an annual 4.6 percent in July, compared with 0.6 percent the previous month. Cement production dropped 8.2 percent. Mining and quarrying fell 1.8 percent, compared with growth of 0.6 percent in the previous month. Crude oil and gas condensate production fell 1.9 percent compared with a year ago. Electricity, gas and water output increased an annual 5 percent, compared with 4 percent in the previous month. News of bombs falling in Georgia slammed Russian investor sentiment on Friday, leading stock markets to plummet, the rouble to wilt, and rating agencies to note the risks of an all-out war in the Caucasus. The mounting violence was the latest in a stream of bad news that has sapped investor appetite for Russia since last month, and pushed the RTS Index down 25 percent since July 1. The government's fierce criticism of coal miner Mechel last month triggered a bear market, which was exacerbated by the start of a major retreat in the oil price. 50 basis points was added to Russia's overall risk premium on Friday alone, and the weakening rouble may well encourage investors to further unwind positions in Russia. Fears have also increased that Russia's fiscal policy might be further be weakened by the conflict, as security agencies asked for more budget funds from the finance ministry. The spread on five-year Russian sovereign credit default swaps (CDS) - instruments with which bondholders insure themselves against a possible default -widened to 116 basis points from Thursday's 102. The ruble also fell by more than 1.3 percent against the dollar on Friday, striking a further blow to investors appetite for ruble-denominated paper. The dollar's unexpected strength was in part due to a broad-based rally in the U.S. currency as it reacted to concerns about the health of Japanese and euro zone economies. The rouble, seeing record trading volumes of $14 billion, three times above the average, weakened to 29.75 versus the basket of 0.45 euros and $0.55, retreating further from a high of 29.26 set on Monday. The most liquid stocks were hardest hit on Russian and Georgian exchanges as traders sold whatever they could. Russia's benchmark RTS index fell 6.5 percent to 1,722.7 points, its lowest levels in 14 months, prompting Raiffeisen bank in Vienna to lower its year-end target for the index by 600 basis points to 1,900. Though less hurt, the MICEX came within half an index point of a 21-month low, trading as low as 1,352.9 points. Russia's largest oil firm, state-controlled Rosneft, fell 7.8 percent while gas export monopoly Gazprom shed 5.2 percent. Outside the energy sector, car maker AvtoVAZ lost 8.7 percent and Sberbank fell 6.3 percent. As the fighting escalated, nervousness spread to emerging markets outside of Russia and its former Soviet satellite, pushing the MSCI benchmark index for all emerging markets to its lowest level since August 2007. Moody's ratings agency said that the escalating conflict should not affect Russia's sovereign debt rating or outlook. Fitch said earlier in the year that any conflict would be more likely to prompt a downgrade of Georgia than its much larger neighbour. But it warned any conflict sparking a division with the West might make it more difficult for Russian firms to refinance their corporate debt. Russia's July inflation rate fell back a bit in July from its highest level in five and a half years to 14.7 percent as fruit and vegetables costs declined. Annual price growth fell more than expected from 15.1 percent in June, according to the latest data from the Federal Statistics Service this morning. Month on month, prices were up 0.5 percent, led by a 6.7 percent decline in fruit and vegetables. 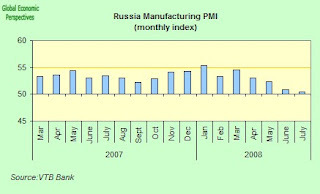 Russian indutry is also slowing, and manufacturing output rose in July at the slowest pace in two and a half years after inflation led to job cuts and fewer orders, according to VTB Bank Europe's Purchasing Managers' Index from Aug. 1. Services however are still expanding rapidly, and there is little sign of the credit driven consumer boom abating yet. 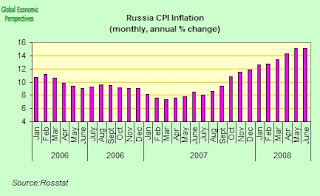 So there is not that much to cheer about in this months report, since inflation is clearly a long way from being beaten. Bank Rossii has raised interest rates four times this year in a bid to reduce consumer demand and inflation. The bank has also expanded the ruble's trading band at least three times since May 14, when it said it would intervene in foreign-exchange markets at varied and unpublicized levels to deter speculators and curb inflation. Growth in Russian service industries, ranging from banking and telecommunications to restaurants, slowed slightly in July from a 32-month high in June. VTB Bank Europe's Purchasing Managers' Index for services fell to 58.3 from 59.1 in June. A reading above 50 shows expansion. Economic growth in Russia, the world's biggest energy exporter, is being stoked by record crude prices, which are boosting wages and consumer spending. Retail sales rose an annual 13.8 percent in June and the inflation rate remained at 15.1 percent, according to government figures. Russian manufacturing expanded in July at the slowest pace in two and a half years as new orders fell amid high inflation and companies cut jobs, according to the VTB Bank Europe's Purchasing Managers' Index, which fell to 50.4 from 50.9 in June. A figure above 50 indicates growth, below 50 a contraction. The bank surveyed 300 purchasing executives to produce the index. Weakness in new orders growth and the first decline of exports orders since Sept. 2007 were behind the fourth consecutive monthly decline in the index. Higher prices for metals, energy, fuel, plastics, food, chemicals and timber underpinned concerns of survey respondents over the economic outlook, according to VTB.